So I’ve somehow gone for months not having added a review of Mass Effect 2 on here, and since the release date, added DLC packs have complicated any narrative I might want to spin by adding additional content onto the core game. So, attempting to take that all into account, where does the game stand on this very, very belated review? Well, let’s put it this way: you’d better be looking for a GOTY edition of Mass Effect 2 or something, because the amount that the DLC packs add on is quite significant. In fact, going back to a copy of the core unvarnished game feels pretty hollow in comparison because once you’d had a taste of the expanded universe and options that the DLC brings, well, it’s just really impossible to feel the same way. So soon after checking up on the M8 Avenger assault rifle, I decided to take a look at that Volpin Props blog again. Turns out he went all the way and built himself a set of the iconic N7 armor that Commander Shepard wears in the game, though not bulletproof and incapable of generating kinetic barriers. 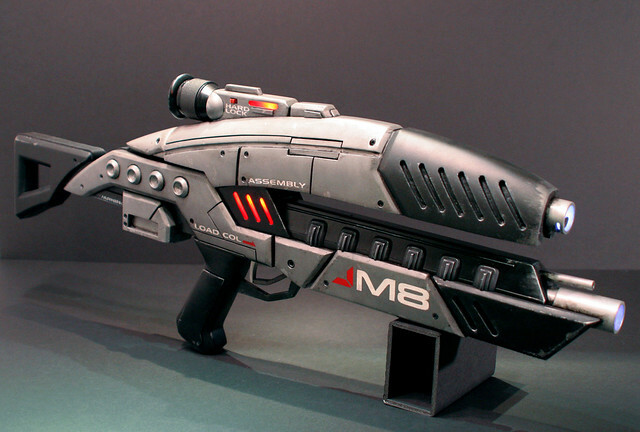 Coming from a site called Volpin Props is a stunning recreation of the M8 Avenger Assault Rifle from Mass Effect 2, also featured in Mass Effect 1 but as a generic model for many kinds of assault rifles from the Hahn-Kedar lines. Built with wood pieces and some scavenged parts and free paint, the total cost? Ends up being around $28. That’s a movie-quality result for $28, some elbow grease and dedication. I love it. See the full building process at his Volpin Props blog, here. In a move that is sure to cause 360 fanboys around the world no short shrift of butthurt, CEO Ray Muyzka of BioWare announced that the company will bring Mass Effect 2 to the PlayStation 3 system. Also included was the fact that bonus content will also be included with the PS3 version. You can read more about it here. You can also watch the trailer announcing the fact at the bottom of that page.